The next step in the development, progress and support of two-time World Duathlon Champion, Emma Pallant, was confirmed today, with the Ironman 70.3 Weymouth champion announced as a member of the BMC-Etixx Pro Triathlon Team powered by Uplace for 2017. The 2017 line up announced shows that Will Clarke continues with the team for a fourth year, but after a year with the team, David McNamee will not be with squad next year. Here is the full announcement, courtesy of General Manager Bob De Wolf. It was nearly a decade ago in 2008 that Uplace, as founding partner, made the first steps into the sport of triathlon. Since then, the team has continued to grow and has gone from strength-to-strength to become one of the leading international triathlon projects. Next year will be the 10th season for the Belgian based international triathlon team. Since the launch of the international Team in 2014 the results have been outstanding with the team finishing on the podium in nearly 50% of the races. In the last three seasons the BMC-Etixx athletes won a total of 42 races and finished on the podium in 97 of them. This includes 6 continental championship titles (IM European Championship Frankfurt, IM70.3 European Championship Wiesbaden, IM Asian Pacific Championship Melbourne, 5150 US Pro Championship Hy-vee, IM70.3 Latin American Championship Brazil, IM70.3 Middle East Championship Bahrain), a podium finish at the World Championship Ironman in Hawaii and victories in a number of the most prestigious races on the calendar (including wins in IM Lanzarote, IM Nice, IM Cozumel, IM Cairns and 2 x IM Zurich). 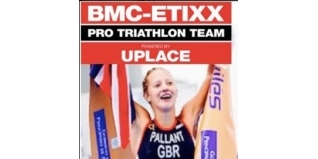 Emma Pallant, Amelia Watkinson, Maurice Clavel and Patrik Nilsson are the new faces in the team and will join the BMC-Etixx Pro Triathlon Team powered by Uplace from next season onwards. Patrik Nilsson had a phenomenal 2016 season, going sub-8 hours in two Ironman events. Nilsson won Ironman Copenhagen in the 8th fastest time ever recorded in an Ironman event and followed that with another record breaking, sub-8 hour performance, taking the win in Ironman Barcelona only six weeks later. At only 25 years of age, the Swedish athlete is one of the most exciting talents on the long distance triathlon scene. Emma Pallant (27) is a former Team GB athlete, running qualifying times for both the Beijing and London Olympics on the athletics track. The British athlete only recently made the move to triathlon, bursting onto the scene in 2016. Pallant won IM70.3 UK, finished on the podium at 6 x IM70.3 distance events, extended her World Title Duathlon and won another 6 short distance triathlon events to make 2016 a real breakthrough year. Ever since she turned pro in 2015 Amelia Watkinson (25) has been dominating the Asian Pacific Triathlon scene, winning no less than 9 triathlon races on the Asian Pacific calendar this season. That is a dream debut for the New Zealander, including wins at IM70.3 Busa Korea, Challenge Jeju, Challenge Kanchanaburi, ITU LD Weihai, Challenge Iskander Puteri, 5150 Subic Bay, 5150 Bohol and most recently Laguna Phuket Triathlon. Maurice Clavel (28) started his career at the Olympic distance and made a very successful transition to long distance triathlon, becoming vice European Champion IM70.3 in 2014. Since then Clavel became a consistent podium finisher at some of the most prominent IM70.3 events in the world, including three second places in 2016 alone. Only 3 months ago Clavel finished 8th at the World Championship IM70.3. Patrik Nilsson agrees: “To be a part of the BMC-Etixx Pro Triathlon Team gives me a real opportunity in trying to get the best out of me as an athlete. To get the knowledge the team offers in training, testing, equipment and racing provides such a benefit and opportunity to bring the best out of you as an athlete. There are very few teams out there who are able to provide their athletes with such a set up and support. My main goal for 2017 will be the Ironman World Championships in Hawaii. I am 25 years old and it will be my debut in Kona. To qualify, I will start my season with defending my title in 70.3 Barcelona and then compete at the 70.3 European Championships in Elsinore. BMC-Etixx athlete Liz Blatchford is expecting her first baby in June 2017. The BMC-Etixx Pro Triathlon Team will support Liz in this fantastic journey and be part of her comeback to racing later in the year. General Manager De Wolf adds: “Liz has been a phenomenal athlete for the team, not just in terms of results and performances, but also as a through ambassador for our partners and as a fantastic person to work with. We are delighted for Liz and her husband and very pleased to be able to support Liz in these very exciting times. It is Liz’s personal ambition to aim for a comeback towards the end of 2017 and we are fully committed to support her in this”.